Macclesfield and East Cheshire CAMRA Pub of the Year 2010! Right on the official boundary of Bollington (the farm across the road is in Rainow), this handsome stone building, adorned in summer with luxuriant window boxes and hanging baskets, houses a friendly and cosy award winning country pub. The staff are chatty and cheerful. One of only two free houses in Bollington and with an entry in the Good Beer Guide. Regular winners of CAMRA awards, they were awarded Macclesfield & East Cheshire CAMRA Pub of the Year 2010! The Poachers is a particular favourite of your webmasters! Monthly Quiz night (always last Sunday in the month, 8.30pm, but also often an additional charity quiz night on the second Sunday, 8.30pm). Rob & Helen were deservedly recognised by Bollington Town Council for their exceptional charity fund raising over very many years. Food is served at every session on Tuesday to Sunday. On Mondays customers are invited to bring in their own food or a takeaway (the Viceroy is opposite) and plates and cutlery will be provided! The Poachers usually carries an ale from Storm Brewery, with two or three additional guest cask ales selected from across the country. Awarded Cask Marque status. Boddingtons is available on gas, together with a variety of lagers, with ciders and Guinness completing the lineup on the bar. On the back bar there is a spectacular selection of both malt whisky and gin ! There is also an outstanding selection of continental and eastern European bottled lagers available. For the wine drinkers they have a competent range. One of the most popular tables in town. Everything cooked on the premises. Crisp fresh vegetables, and locally sourced meats. Bar snacks are copious and always freshly prepared. Wednesday evening is Pie Night! Enjoy a wedge out of a big pie, very popular – booking recommended! Book for peak periods. Regular special events featuring favourite menus and dishes – Thai evening, Indian evening, etc. An invited chef also puts on Fruits of the Forest dinners, usually on a Monday evening. See the website for further details on all of these. Pleasant rear garden, access through the bar with smoker’s shelter. Barbecues in summer, weather permitting. Car park across the lane at side of pub. A walking guide book is available from the Poachers, which presents 18 guided walks, all starting from and ending at the Poachers. Finding it: At the north east end of town, from the bus turn round outside the Turners Arms, go up Ingersley Road; the Poachers is at the end on the right. Later named `The Masonic Arms`. 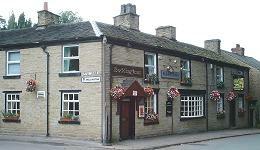 And finally `The Poachers Inn` which has been owned and run by Rob and Helen Ellwood since 2000.